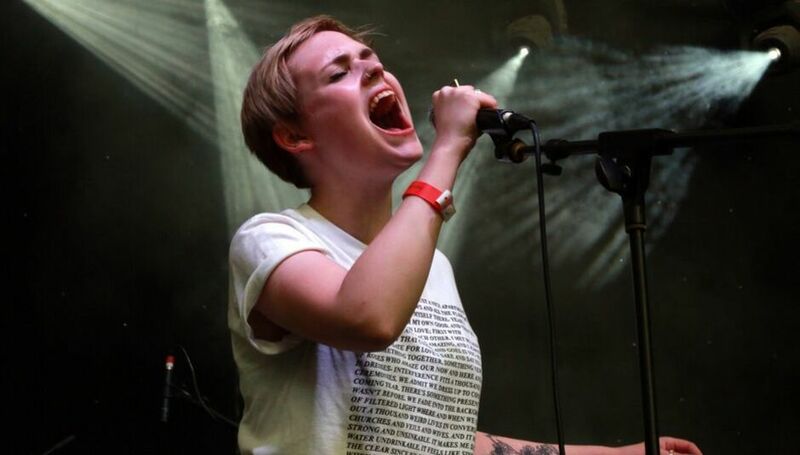 Last weekend may have been one of the busiest on this summer's festival calendar - in the UK alone we counted 13 - but there's only one place any discerning fan of independent pop music was likely to be: Indietracks. Now in its ninth year, as well as providing a veritable feast of music it can also boast an onsite parrot and owl rescue, steam roller can crush and four stages set in some of the most unlikely of settings. After all, where else would you find former members of Hefner and The Weather Prophets pitting their wares in a church, or countless others performing half hour acoustic sets in the carriage of a steam train? Set on the grounds of the Midland Railway museum at Butterley in Derbyshire, this year's line-up proved just as mouthwatering as its predecessors, even if the weather was a source of discomfort for most of the weekend. Despite the constant drizzle from mid-afternoon until the early hours of Saturday morning, Friday's bill attracted a steadfastly large crowd. Openers Fever Dream, making their second appearance at Indietracks having first played in 2013 got the weekend off to a loud and lively start. Their errant shoegaze flits somewhere between the Jesus & Mary Chain's shambolic excess and Creation Records era Pastels, singer/guitarist Adrian Fleet and bass player Sarah Lippiatt both diminutive figures throughout the band's 40-minute slot. Cardiff outfit The School have also been regular features at Indietracks over the years. Aesthetically and musically owing much to the traditional C86 template, they're a pleasant if at times unspectacular interlude for this evening's headliners, particularly singer Liz Hunt who takes the award for bubbliest performance of the weekend by an artist not in The Go! Team. Later on we learn the band had some equipment stolen from their car (as did fellow indie poppers Flemmings) which serves as a stark reminder of society's ills lurking even in the most refined of places. Although initially formed by David Gedge and then-partner Sally Murrell in the wake of The Wedding Present calling it a day during the late Nineties, their subsequent reformation has seen the Cinerama alter ego run in tandem this past decade. Tonight's career spanning set proved no exception, lifting 14 songs from all areas of the Cinerama vaults with even a couple of Wedding Present compositions thrown in for good measure. Admittedly both came from Valentina, a record since credited to both bands, but nevertheless it highlighted another couple of strings on Gedge's impressive bow. Elsewhere, debut single 'Kerry Kerry' and the equally delectable early compositions 'Ears' and 'Honey Rider' remind us why we got so excited about them in the first place. Glorious sunshine greets us on the Saturday morning and the Poets Pippin cider - one of several potent local brews on offer throughout the weekend - is flowing early doors. Chorusgirl, a four-piece from London set the bar high from the outset, their shimmering brand of 4AD-inspired noir pop reaching an excitable climax when they're joined onstage by assorted members of The Tuts, Feature, The Fireworks and Ace Bushy Striptease among others for a riotous run through closing number 'I Give Up'. Spanish duo Los Bonsais make a right old racket too, conjuring up memories of early My Bloody Valentine, The Shop Assistants and Delta 5 respectively while earning several indie brownie points for their cover of the Television Personalities' 'Part Time Punks'. Although it's still only July, shortlists are being drawn up for 2015's album of the year and one of those candidates has to be Evans The Death's Expect Delays. Now a much more assured presence than the exuberant teenagers that first took the stage here three years ago, their set on the outdoor stage draws one of the weekend's biggest crowds, and deservedly so. London-based trio Feature also blast any lingering cobwebs away, fusing punk rock nuance with riot girl sentiment for 30 breathtaking minutes. Over yonder Barcelona five-piece The Free Fall Band sound like Vampire Weekend with the addition of a saxophone. Understandably, Indietracks stalwart Emma Kupa's new outfit Mammoth Penguins also draw a sizeable audience, many of whom no doubt remember her time in scene favourites Standard Fare. However, it's newer songs like 'March of the Penguins' and 'When I Was Your Age' that steal the show and copies of recently released debut Hide and Seek are snapped up accordingly, providing one of the weekend's must-have accessories. Even more impressive are Desperate Journalist, whose spiky take on new wave threatens to rule the day if not the entire weekend. Energetic frontwoman Jo Bevan channels the aggression and elegance of a young Siouxsie Sioux, while guitarist Rob Hardy delivers swathing melodies Johnny Marr would have approved of back in the day. Kohl and leopard skinned bass player Simon Drowner could have passed for a Manic Street Preacher 25 years ago and he and drummer Caroline Hellbent prove they're no slouches when it comes to holding a backline either. In short, they're a revelation as well as a welcome break from the norm. I've never met anyone that doesn't like The Wave Pictures and even my partner's 10-year-old cheerfully sings along to the chorus of 'Strange Fruit for David'. Playing to a packed indoor stage, the trio look genuinely taken aback at the ecstatic response they're afforded. As the evening draws to a close, it's left to another of the indie scene's long-time favourites The Pains Of Being Pure At Heart to bring the second day to a close. Returning for their second time as headliners - Kip Berman and co. first topped the bill here in 2010 - tonight's set combines a selection of their most popular songs with a couple of surprise but equally impressive covers. Joined this evening by A Sunny Day In Glasgow's Jen Goma who also played on the band's last record Days Of Abandon, they've come a long way from the incredibly shy performers that first graced UK shores back in 2008. Of the aforementioned covers, Berman takes on Felt's 'Ballad of the Band' like it were his own while Goma sings lead on a jaunty version of James' signature tune 'Laid'. Elsewhere, 'Young Adult Friction', 'Belong', Come Saturday' and 'Kelly' are highlights in a set jam packed with them. We're awoken just after 9am the next morning by heavy rain bouncing off the roof of the tent. By midday its become torrential and unfortunately shows no sign of letting up bar an hour of respite by which point all of the remaining outdoor acts have been moved inside. Beforehand, The Catenary Wires play an engaging if short set to the hardy few who've braved the elements while Ralegh Long and Oh Peas! duly entertain with their orchestral folk and acoustic sadpop in the church and on the train respectively. The Fireworks also do their best to bludgeon the rainclouds into submission courtesy of a relentless wave of female fronted buzz pop that recalls all the usual suspects which is never a bad thing when all's said and done. A large and spirited crowd has gathered at the outdoor stage for the return of indie pop sensations The Darling Buds, and with good reason. Having been one of the scene's most commercially successful acts back in the Eighties, the likes of 'If I Said', 'Tiny Machine' and 'Hit The Ground' are treated like long lost friends as Andrea Lewis and her four accomplices deliver them with impeccable aplomb. Unfortunately, the rain becomes unbearable by the time they're finished culminating in those that remain onsite heading for any form of indoor sanctuary. What that means is Laetitia Sadier plays to a smaller crowd than her talents deserve through no fault of her own, which sparks the organisers into action when the final two acts on the outdoor stage are rescheduled to play inside. Fusing heavily orchestrated drones with elements of noise and monotone vocal readings, supergroup-of-sorts The Luxembourg Signal are another of the weekend's unexpected highlights. Featuring past members of Trembling Blue Stars and Aberdeen among their number, we're reminded of Stereolab, Spacemen 3, and yes, Hawkwind - a comparison that horrifies singer Beth Arzy when we collar her in the merchandise tent later - in their seemingly short but incredible set. Durham indiepop sensations Martha have been an unprecedented success story in recent years and the packed indoor stage that greets their arrival on stage tells its own story. Songs from last year's debut Courting Strong arrive thick and fast as does an obligatory cover of Celine Dion's 'My Heart Will Go On'. By the end, all four band members have launched themselves into the crowd. For many of their adoring fanbase, the weekend ends here. Only the brave would dare to follow in their footsteps. But then as one of the most unusual bookings in Indietracks history, The Go! Team have already raised the audacity stakes by their mere presence. That they take the best part of an hour and a half to soundcheck proves irritating, particularly for those with last buses and trains to catch on this wet Sunday evening. Nevertheless, the six-piece more than make up for it with a delectable set of genre-pollination that takes in anything and everything from folk and shoegaze to hip hop ad northern soul, even if just over 45 minutes later they're gone. As the campsite disco finally subsides at 4am, its time to reflect on another hugely enjoyable Indietracks weekend despite the awful weather. Here's to next year's tenth anniversary, which promises to be the biggest birthday party this little corner of Derbyshire has ever seen.